Firecracker Flower – the name given to Crossandra Infundibuliformis, is as unusual and fantastic as this lovely plant itself is. Growing as a small shrub, this lovely tropical bloomer produces flowers of salmon, yellow or orange color all through the year. A cousin of Black-eyed Susan, Firecracker Flower belongs to Malaysia, Sri Lanka, Pakistan, India and Madagascar where it grows as evergreen shrub. It is an excellent ornamental plant for both indoor and outdoor usage. However, the best results are achieved when it is grown in garden beds under bright sunlight. Firecracker Flower is propagated from cuttings and grows easily as long as it is protected from freeze and frost. The plant bears glossy green foliage that provides a decent background for its showy flowers. Most gardeners grow Firecracker Flower in mix borders, garden beds or as a small hedge. When provided with moderate watering and fairly rich soil, this lovely bloomer would continue to produce colorful flowers for many years. The flowers last long and are often used locally in preparing garlands. Flowers are followed by seed pods that ‘explode’ to spread seeds all around and thus giving the plant its common name – Firecracker Flower. 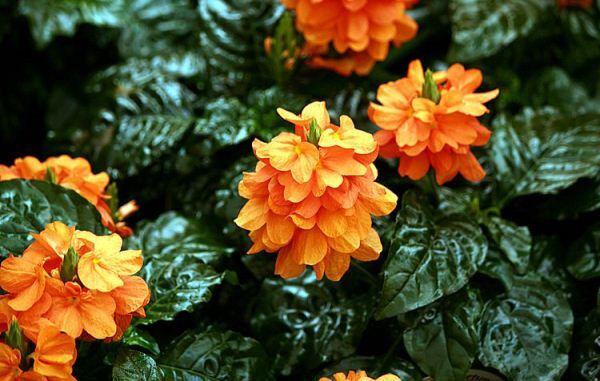 Popular varieties of Firecracker Flower include: ‘Lutea’ or Yellow Crossandra and ‘Tropic Flame’.